இன்று ஸ்ரீ வரதராஜர் உத்சவம் கடைசி நாள் - திருவல்லிக்கேணியில் தேவாதி ராஜர் பவளக்கால் விமானத்தில் புறப்பாடு கண்டருளினார். Today, 28th May 2016, is 10th day of Sri Varadha Rajar Uthsavam.. ‘Sarrumurai’ purappadu in the beautiful “Pavalakkal Vimanam”. Not sure, why this is called ‘Pavalakkal’ – pavazham is ‘coral’. Corals are marine invertebrates in the class Anthozoa of phylum Cnidaria. Precious coral or red coral is the common name given to Corallium rubrum and several related species of marine coral. The distinguishing characteristic of precious corals is their durable and intensely colored red or pink skeleton, which is used for making jewellery. Recent reports state that Coral ecosystem thriving in the Indian waters has come under severe stress with instances of coral bleaching being reported from islands of Lakshadweep and some parts of Andaman. It is the thermal stress in the form of increase in Sea Surface Temperature (SST) during April that has proved disastrous for the corals. Coral bleaching is the loss of intracellular endosymbionts through either expulsion or loss of algal pigmentation. In a decisive move, Thailand has shut down 10 popular diving sites in a bid to slow a coral bleaching crisis –a rare decision to put the environment before tourism profits. The country’s southern coastline and islands are home to some of the world’s most prized white sand beaches and scuba diving sites, and the booming tourism industry props up Thailand’s sagging economy. But warming waters and ever-growing swarms of visitors have damaged coral reefs and ecosystems. Amidst growing concern about the impact of coral bleaching, scientists have also brought out some good news from the ocean depths of Andaman. The branching corals that were destructed during the 2004 South Asian tsunami have started regenerating in the region. Inside Pavalakkal vimanam, Devathi Rajar gave darshan in Paramapadhanadhar thirukolam – Perumal has similar thirukolam in Sesha vahanam also. The two photos right here are of Sri Varadhar at Thirukachi in Sesha vahanam – photo credit Sri VN Kesavabashyam. Today 26th May 2016; is day 8 of Sri Varadharajar Brahmothsavam - for us, Perumal Kovil is ‘Thirukachi Devathirajar Thirukovil’ – the place where Brahma started the annual uthsavam. 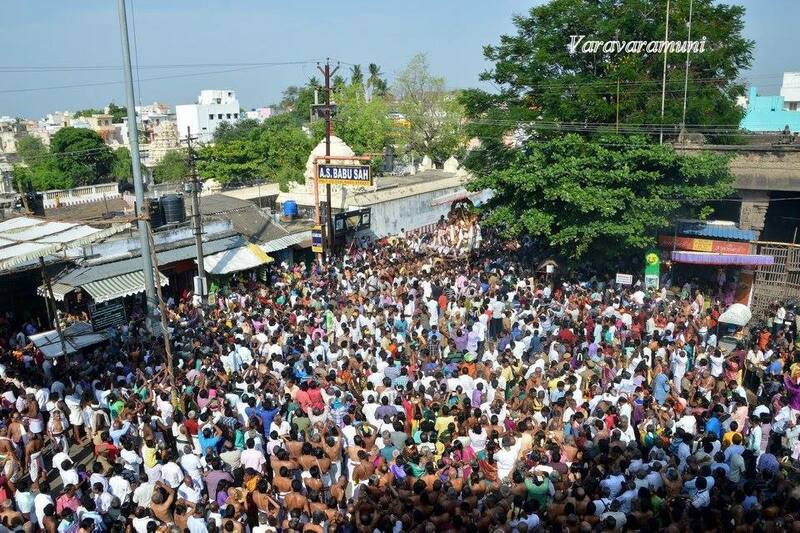 At Thirukachi, lakhs of devotees assemble during this grand brahmothsvam and here are a couple of photos taken by my friend VN Kesavabashyam, during Garuda sevai that will take you to Kanchipuram !! The horse (Equus ferus caballus) has evolved over the past 45 to 55 million years. Horses' anatomy enables them to make use of speed to escape predators and they have a well-developed sense of balance and a strong fight-or-flight response. Horses have significant place in history, especially battles and formation of kingdoms. In Ponniyin Selvan of Kalki, when Vandiya Devan is thinking of Nandini, the sounds of galloping horses disturbs his silence. Those flying horses raise a cloud of dust swirling like a mini tornado, and Vandiyadevan is able to recognize Parthiban Pallavan astride. The book ‘History of Vijayanagar’ mentions of inscription discovered at Talugunda, Mysore in AD 1894 containing information about Haritaputrus of Manavyagotra. A clan Mayurasarma goes to Kanchi, where he gets into dispute about the Pallava horses; is so enraged about the insult that he learns the art of using weapon. Then there is the Pallava emperor Parameswaravarman 1, who ruled in the latter half of 7th Century ascending the throne after Mahendravarman II. His reign was marked by revived conflicts with Chalukyas – his horse named ‘Atisaya’s valour’ is reportedly noticed in sculptural representation. 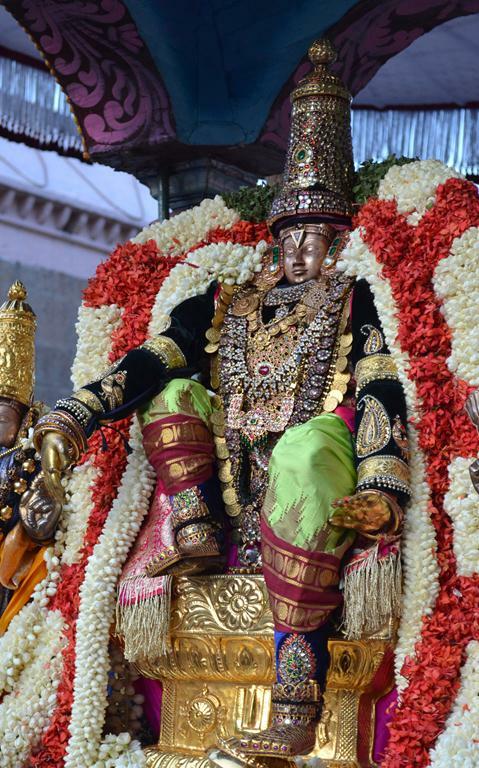 Today it was the beautiful gold hose that carried Lord Varadharajar that attracted all of us – it was Kuthirai vahanam for Devathi Rajar and here are some photos of the purappadu at Thiruvallikkeni. The annual brahmothsavam of Sri Varadharaja Swami is now on and today 22nd May 2016 is day 4 – At Thiruvallikkeni, there is purappadu in evening only and it was Sesha vahanam today and here are some photos taken during purappadu. 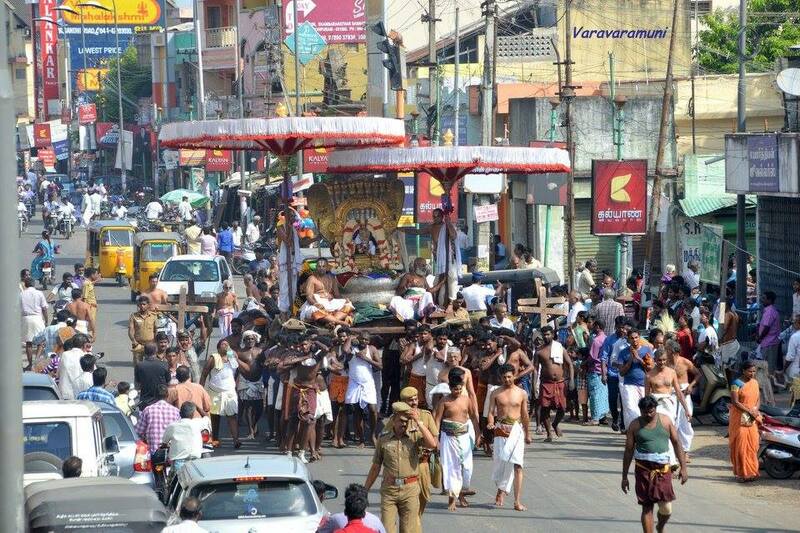 The uthsavam follows the Uthsavam at Thirukachi. Kanchi has a rich history and was associated with the Pallava dynasty as the Pallava rulers ruled the Thondai mandalam for long. 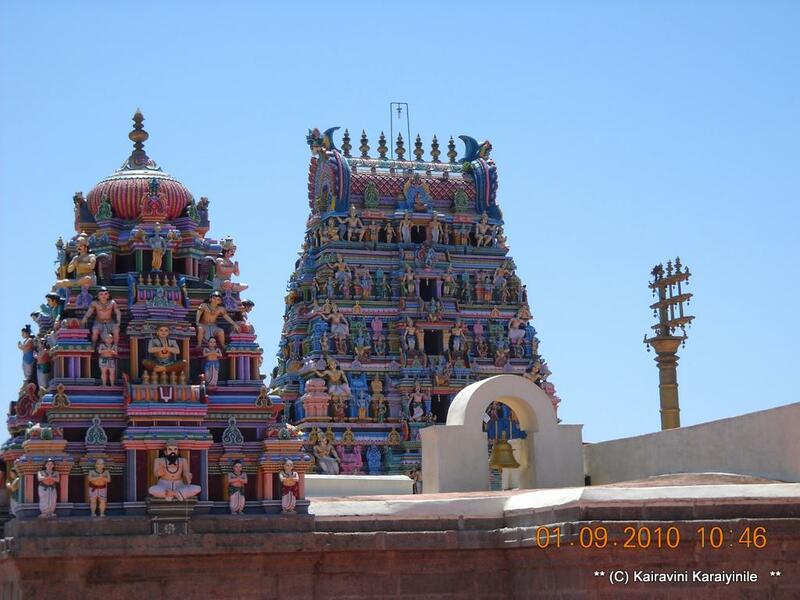 Pallavas established their capital at Kanchi (modern day Kanchipuram famous for weaving and silk sarees) which gradually became popular and famous for its temples and as center of Vedic learning. At Vishnu Kanchi, is the famous temple – Perumal Kovil - temple of Lord Varadharaja Perumal, known as Hastagiri. The Temple is a huge one on a 23-acre complex and shows the architectural skills of ancient Vishwakarma Sthapathis in temple architecture and is famous for its holiness and ancient history. In this earthly World full of conflicts, people often are listless, fear everything and do not have a composed mind. What should they look to ? ஒருவகைக் கலக்கமுமில்லாத இடம் பரமபதம் ** அவ்விடத்தை நமக்கு அளிக்க வல்லன் எவன் என்ற கேள்வியும் உளதோ ? 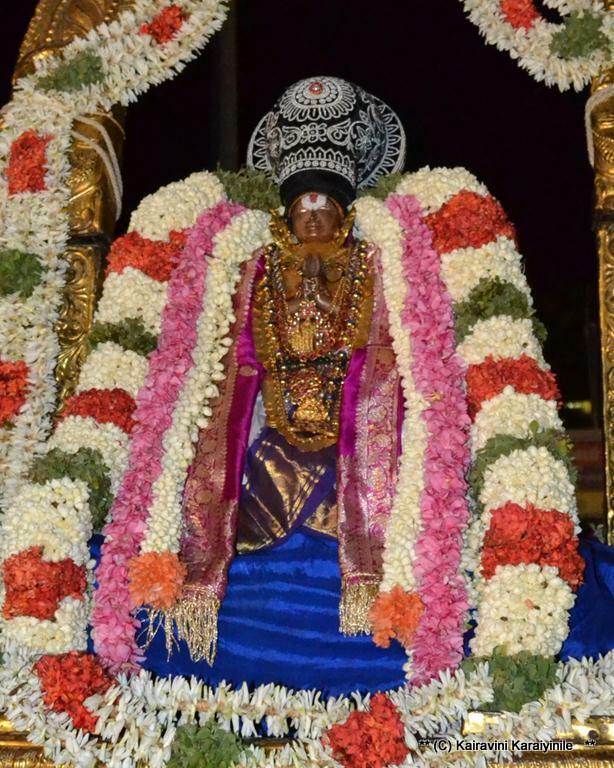 The annual brahmothsavam of Sri Varadharaja Swami is now on and 21st May 2016 was day 3 - the famous Garuda Sevai – when Lord is taken in procession on vahanam of Garuda also known as Periya Thiruvadi. Garuda Seva is grand, majestic and has special significance at Kanchi’s link with Sholinghur because of Swami Doddayachaaryar. Even in Kali Yuga – Perumal had direct interaction with Thirukachi Nambigal and our Thoddachar Swami, whose lineage is doing great kainkaryam to Sri Akkarakkani Emperuman at Cholasimhapuram. Forefather of the present day Acharyar, who lived during 16th century, was an ardent devotee of Lord Varadharaja and did many kainkaryams to Him. He was a regular in the annual Vaikasi Garuda Sevai of Devathirajar. 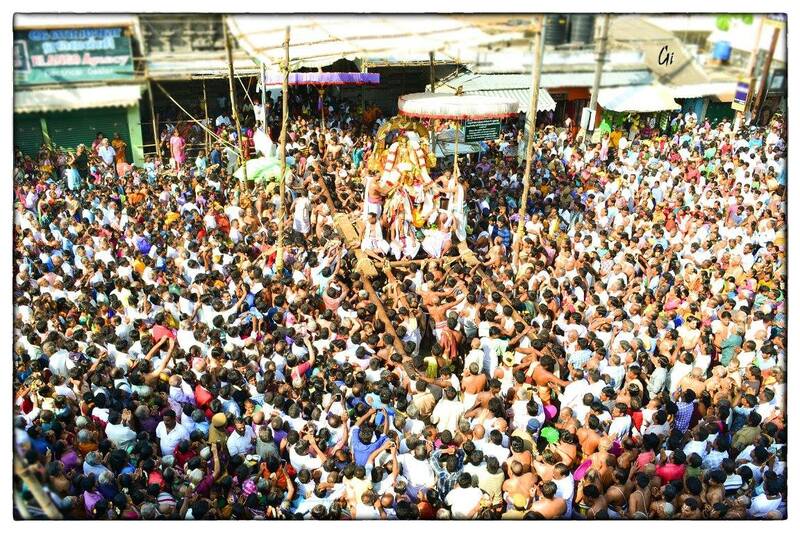 Legend has it that on a particular year, he was not well and could not attend the Garudothsavam at Kachi. He was feeling desperate about his misfortune of not being able to have darshan of PerArulalar at Kachi on Garuda vahanam. He lamented standing near the Thakkan kulam at Cholasimhapuram (Sholinghur]. He composed hymns on Varadharaja, known as Sri Devaraja Panchakam. He longed for the Lord's sevai and these outpourings were a direct result of his bakthi and state of mind. Emperuman the most merciful Sriman Narayana will never let his ardent bhaktha down. He came down to Sholinghur and gave darshan to Dhoddacharyar - seated on Garuda vahanam. Such is the mercy and leela vinotham of PerArulalar. Even today, on VaikAsi GarudOthsavam day, there is the tradition known as Doddayachaaryar Sevai, when the archakas hide Lord Varadhar at the western gate for a short time with two umbrellas just before He leaves the temple. It is believed that Lord goes to Sholinghur for giving darshan to Dhoddacharyar. The mangala aarathi takes place thereafter. On the glorious Garuda Seva time, we remember the great Acharyar and fall at the feet of the Acharyars through whom only we can reach our Emperuman. 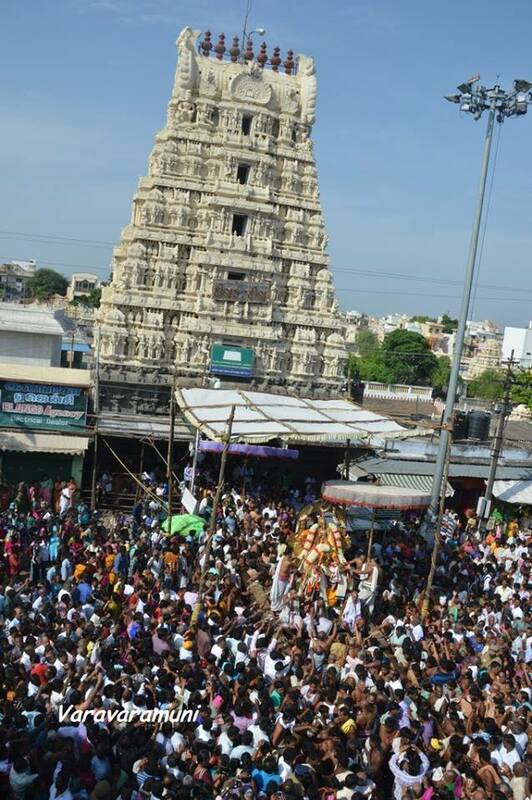 At Thriuvallikkeni divyadesam, this morning there was grand purappadu on Garuda vahanam ~ one will have to be at Thirukachi, to see and believe the crowds and the grandeur – here is a photo posted by FB friend Girivel. 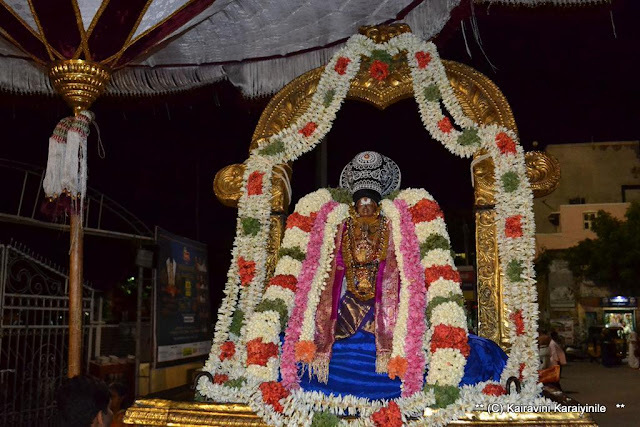 Vaikasi masa pirappu at Thiruvallikkeni 2016 : கண்ணனையே காண்க நங்கண். Today 14th May 2016, marks the birth of Tamil month of Vaisakhi. It is a time whence during peak summer, the skies could turn dark and people would look forward to summer rains that will reduce the heat and bring some relief. Fisherfolk who use traditional craft eagerly await the Chithra Maasa Puyal, a cyclone that comes during the Tamil months of Chithirai and Vaikasi (corresponding to April- May). With 45-day ban on mechanised fishing is in force, those who fish on catamarans and ‘vallam’s look forward to the Kodai Mazhai – for us, things are much different. பேயாழ்வாரின் அமுத வரிகள் : ஸ்ரீமன் நாராயணின் திருநாமங்களைச் சொல்லி, அழகியகையினாலே, அவனையே நாம் தொழுவோம். வண்டுகள் ஒலிக்கும் குளிர்ந்த திருத்துழாய் மாலையையுடையவனுமான, பூமி முதலிய லோகங்களை உண்டு உமிழ்ந்த, திவ்யஸ்ரீ கண்ணபிரானை மட்டுமே நமது கண்கள் காணட்டும். Sri Peyalwar guides us by asking his Heart to praise Sriman Narayana with affection, reciting His many names. There is no other way to salvation than folding our hands and praying to the Lord Krishna adorning thulasi garland containing humming bees. The Lord who swallowed the Universe and remade the earth is the only worthy reason for our eyes. Today, at Thiruvallikkeni, there was chinna mada veethi purappadu for masapravesam and Lord Parthasarathi endowed bakthas. Here are some photos taken during the purappadu. At Thiruvallikkeni divyadesam, on 12th May 2016 is was grand pushpa pallakku purappadu for Sri Parthasarathi, after 10 days of vidayarri… the day had added significance. Of those who remained closest to Sri Ramanuja – Sri Mudaliandan, Sri Koorathazhwan, Sri Embar, Sri Ananthazhwan, Arulalaperumal Emperumanar, Kidambi Achaan, Thirukurugai Piraan Pillan, Thiruvarangathu Amuthanar and more. Sri Mudaliandan Swami is reverred as Trithandam and Sri Koorathazhwan as Thiruppavithram for Swami Ramanujar. Sri Mudaliandan was born as Dasarathi and hailed as ‘Yathiraja Paduka’ – thiruvadi of Bhagwat Ramanujar. Sri Mudaliandan was born in Prabhava year 1027 in Chithirai punarpoosam. At Sriperumpudur, there is no vigraha for Mudaliandan as he stands in the Trithandam and Thiruvadi of Acharyar. Yesterday, being his Thiruvavathara day, Mudaliandan had grand purappadu with Sri Parthasarathi who had purappadu on ‘pushpa pallakku’. 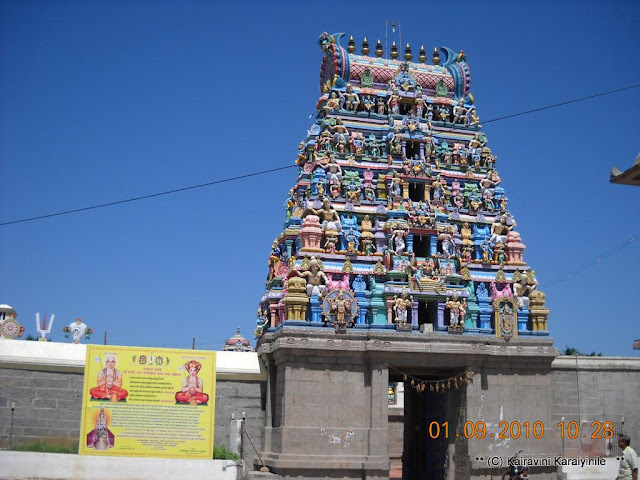 The photos of thirukovil seen here are of Pettai, his avatharasthalam; the vigraha is of Thiruvallikkeni divyadesam. பூக்கள் அழகானவை; அழகானவை; நறுமணம் தர வல்லன ! In some cultures, Roses are the most popular choice; perhaps we see more jasmine here. The Oleaceae are a family of flowering plants in the order Lamiales, comprising 26 genera. The number of species in the Oleaceae is variously estimated in a wide range around 700. The Oleaceae consist of shrubs, trees, and a few lianas. The flowers are often numerous and highly odoriferous. பூக்கள் அழகானவை; நறுமணம் தர வல்லன:: மல்லிகை, முல்லை, செண்பகம், தாமரை,மகிழம், ரோஜா, அல்லி மற்றும் விருச்சி, செங்காந்தள்; ஆம்பல்; அனிச்சம் ; குறிஞ்சி ;வாகை; வகுளம் ; கோங்கம்; என எவ்வளவோ நறுமலர்கள் உள்ளன. பூக்களை அழகாக தொடுத்து இறைவனுக்கு சாற்றி வழிபடுவது நெடுங்காலமாக உள்ளது. Swami Nammalwar says …. ‘the most pleasant fragrance of jasmine –wafting breeze, ears receiving the pleasing kurinji music; Sun setting with beautiful red colours in the horizon – all attracting - but more attracting was the pleasing sight of the fragrant palanquin made of flowers – for they were set for the most beautiful ‘Sri Parthasarathi perumal’. Ananthan (Adhiseshan), the first incarnation serving Sriman Narayana was born as our Acharyar reforming the whole Universe. பெற்றனன் பெற்றபின் மற்றறியேன், ஒரு பேதைமையே. Sri Ramanuja, the King of ascetics, considered only those attached to the lotus feet of Lord Ranganathar as his dear ones. We have the good fortune of associating ourselves to that Great Saint Udayavar, the heart shall not long for anything else, than attachement to the noble Ramanuja. On the sarrumurai day of all Azhwar / Acharyars, there will be purappadu with Perumal. For Udayavar, things are unique. 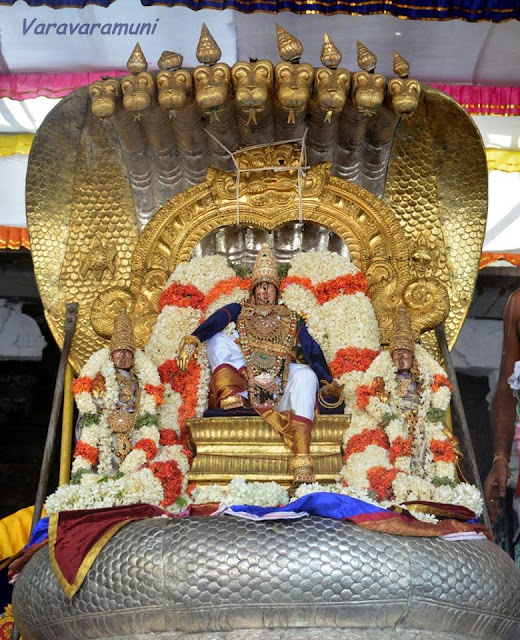 On the evening of Sarrumurai day, Swami Ramanujar had grand purappadu in mangalagiri and here are some photos of the purappadu.